This biography of Joe Paterno by his son Jay is an honest and touching look at the life and legacy of a beloved coaching legend. Jay Paterno paints a full picture of his father’s life and career as well as documenting that almost none of the horrific crimes that came to light in 2012 took place at Penn State. Jay Paterno clear-headedly confronts the events that happened with cool facts and with passion, demonstrating that this was just one more case of an innocent man convicted by the media for a crime in which he had no part. Noting that the scandal itself was but a short moment in Joe Paterno’s life and legacy, the book focuses on Paterno’s greatness as a father and grandfather, his actions as a miraculous coach to his players, and his skillful dealings with his assistant coaches. A memorial to one of the greatest coaches in college football history, the book also reveals insightful anecdotes from his son and coaching pupil. Click on the photo of the book above to order right now and get your personalized autographed copy directly from Jay Paterno! 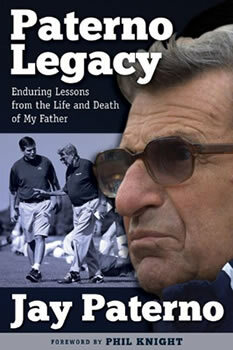 I have personally purchased 6 copies already, they make great gifts for any Penn State and Joe Paterno fan. Click on the book picture above to order your copy directly from Jay Paterno himself, and get it autographed! Only a Son could tell the story of enduring lessons from the life and death of his father, and Jay has done it perfectly in his book.